Hazy is a pony I have treated since June 1994. Her primary symptom has been labored breathing which is aggravated by warm humid weather, management changes, and diet changes. Homeopathy and acupuncture have given her some relief, but Hazy has never been completely healthy. In April 1997 Hazy became much worse after fields surrounding her pasture were sprayed with fertilizer. 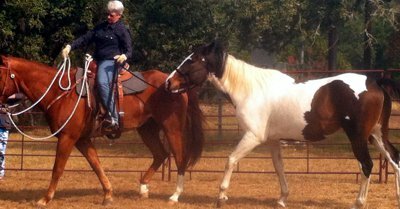 Her breathing became worse and she developed symptoms of Laminitis. She was given 3 doses of the Homeopathic remedy Nux Vomica 200c and started on COQ10 300 mg a day. Her feed was changed to bran mashes and frog supports were put on her feet. After 4 days she was walking almost normally and her breathing was the best it had been in years. Hazy has continued to improve and her COQ10 has been reduced to between 120 mg from 240 mg a day depending on the humidity. She is walking well. Her owner bought new hay that was recently fertilized and this seemed to aggravate Hazy's condition. She improved when she was put back on her old hay. Fancy: 17-year-old Arabian mare. Episode in 1994. Presented August 1997. Previously treated with high doses of heparin, Bute, Acepromazine and DMSO. This episode started in July, and Fancy was not responding to Bute, Ace and Ixosuprine. She had 7°-8° rotation in both front feet. Her diet included sweet feed, oats and fertilized pasture. She tended to be overweight and would weave and pace when kept stalled. She had melanomas removed in 1993, but the tumors recurred. Her vaccination history included VEW-T, Influenza, Rhinopneumonitis, Rabies, Strangles and Potomic Horse Fever once a year, and Influenza and Rhinopneumonitis every four months. Deworming history was tube deworming with combot every 2 months until recently, when she was switched to daily strongid-c and twice-a-year tubing. Fancy's diet was changed to bran mash, and she was started on CoQ10 150 mg twice a day. Blue-green algae was added to her diet. I encouraged Fancy's owner to bring her to the clinic for treatment. On August 23, 1997 Fancy was brought to the clinic. Changes had been made in her diet, but she was still on Bute, Ace and Ixosuprine. The main goal was to get her off the drugs so that her case could be taken. Fancy was very picky about eating her bran mash with supplements. Nux Vomica 200c was started once a day for three days. Her CoQ10 was increased to 400 mg twice daily. She began to eat better, but became more sore after the drugs were discontinued. On September 2nd she was given Thuja 1m to clear the negative effects of vaccinations. She was Grade III lame on hard ground – very lame at the walk – at this time. On September 5th she was shod with a reverse shoe after radiographs revealed pedal osteitis. On September 9th Fancy was given one dose of Arsenicum Album 10m. Fancy's stall-pacing and picky eating led me to Arsenicum. I chose a high potency because Fancy had a strong vital force, and her symptoms were mostly those of dysfunction without excessive pathology. In other words, she had mainly soft-tissue swelling in her laminae with minimal bowel changes or other organ damage. On September 10th Fancy was walking better but had loose manure. The loose manure indicated a response from the vital force to the remedy. Her improved walking suggested a correct potency had caused improvement with a minimum of aggravation. I was a bit concerned that improvement had happened too quickly, and that the remedy might only be palliative. Fancy continued to improve, however, and was sent home walking well. She continues to be sound. I believe Fancy was a very healthy horse who was actually made sick by excessive vaccinations and toxic dewormers. Her owner only wanted the best care for her. Luckily, Fancy's strong constitution helped her recover quickly. Lady Hawk: 7-year-old Grey Arabian mare. Lady Hawk has been showing laminitis symptoms for 7 days. She was brought into the clinic on May 31, 1995. Lady Hawk had been seen by another veterinarian who had put her on Bute and Banamine, and who had told the owner to bring her in and have her deep digital flexor cut if she wasn't better in a week. The deep digital flexor tendon attaches to the back of the coffin bone in the foot. These tendons are often cut in severely foundered horses to allow the coffin bone to be "derotated." It is generally a salvage procedure as the reason for the contraction of the tendon has not been addressed. Toxicity is generally the cause of contraction of the muscles and tendons, and in Lady Hawk's case, fertilization of her pasture appeared to be the reason for her illness. When Lady Hawk came into the clinic, she was Grade II lame (walking well, but off at trot), however, she was completely off her feed and her manure was loose. The Bute and Banamine were discontinued and I suspected Lady Hawk had already developed an ulcer. She was started on Nux Vomica 30c twice daily for 3 days to help clear the drugs out of her system. Her lameness increased without the drugs, but her appetite returned in 3 days. She had a tendency to lick the metal walls of the stall, a behavior that stopped as her stomach began to heal. On June 6, 1995 I started Lady Hawk on Calc Carb 30c twice a day for 3 days. I chose this remedy because Lady Hawk was a heavy-boned Arabian with a very friendly disposition. Her soles were very flat and she had a large, round foot. I have found many horses with this foot shape respond to Calc. Carb. Also, an indicating symptom for Calc. Carb is the desire to eat indigestible things; I felt this matched her tendency to to lick the walls. It is also listed in the reportory under "stomach ulcers." Lady Hawk was also starved for minerals, and ate ABC biologicals, BVC, salt, A-mix, 1-1, and TS mix. Heavily fertilized grasses and hays are high in protein, but lacking in other nutrients. We started her on FasTrack powder to help her absorb her feed. By June 9th, Lady Hawk had stopped licking the walls and she was moving well. On June 13th Lady Hawk was trotting and cantering sound, and was discharged several days later.